This 10ml decorative flask containing pure olive oil from the holy land, for the purpose of anointing. This particular flask is termed "Spikenard" conjuring up an intense desire for unity with Christ. Addtionally, the term "Jerusalem" inspires a yearning for the holiness of life, thus when using, one may indeed be blessed with healing forces from heaven. Biblical scripture gives much emphasis to scent, as a means of lifting one's senses to higher realm of being. The original perfume is based on natural essences made of plants characteristic of the Land of the Bible and flowers from the Holy Land. Anointing by oil is also practiced in some churches in blessing the sick. The New Testament records that oil was applied to the sick, and also to wounds (Mark 6:13; James 5:14). Unction is another term for anointing. The oil may be called chrism. 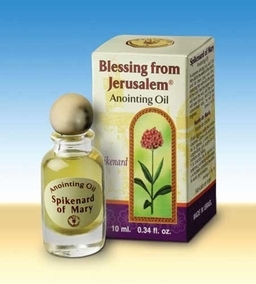 The oil was used to anoint the vessels of the Tabernacle 30:26 and the High Priest, and is traditionally regarded as the oil used by prophets to anoint Saul, David, and other kings of ancient Israel. Anointing thus expresses the desire to become as one with the holy spirit, and to be guided from heaven in all one's actions.